Today I am honored to interview one of my friends that I met directly through game making. I remember meeting Mike at a local playtesting session here in San Marcos, Tx. We had both brought our games to share with the other 6 creative people who also brought their games. Mike’s game “Guild Leader” was definitely one of the best games I played that day. I couldn’t believe it when he told me “It’s my first game to make”. Last night, David and I got the honor to playtest “Guild Leader” and “Ten-Thousand Goblins” with Mike and his wife Julie. One of Mike’s best qualities is his passion for making games. When we get together to try out our new game ideas, our passion feeds off each others. This leads to some very fun and exciting moments and last night was no different. If you would like to keep in touch with Mike and his games, then you can follow his progress on Facebook. 3. How did you get into gaming? – My parents had an Atari 2600 when I was born, so you could say I was born into it. Dad managed a Radio Shack and bought me a Tandy Color Computer when they first came out. So I started playing and coding games when I was about 4 years old and just never stopped. I was introduced to tons of board games, but Dungeons and Dragons is what really sparked the game creation interest. 4. What is the name of the games you have started making? Currently working on “Guild Leader” and “Ten-Thousand Goblins”. 2. When was the first time you remember wanting to create a game of your own? – When I was about 8 years old, I remember watching my parents play Dungeons and Dragons (it was their first time as well). I’d made little games out of code following a book when I was younger, but listening to their friend run the game and watching everyone get so involved made me want to make something just as good. I wasn’t great at reading through rules at that age, plus we’re talking about 1st Ed. Dungeons and Dragons which was a bit much for my age. So a couple years later I wrote my own game (embarrassingly called “Fearsome Foursome”) about a team of heroes that worked together as a special ops team. I pulled stuff from my favorite TV shows at the time. A guy who had cables he could shoot out of his wrists and swing from building to building, plus had a katana…he was my favorite. I had an hour trip on the bus to and from school each day. So a neighbor friend of mine would play through adventures on the bus, playing one character of his choice while I played the rest but let him drive the story. I filled a spiral notebook with maps and rules as we went along, and loved it so much I kept making games and running games from then on. 3. What steps did you take in planning out your game? – Funny enough, “Guild Leader” was actually supposed to be a video game, as was my newer prototype “Ten-Thousand Goblins”. I spent several years building quick video game prototypes but never found a formula that I really thought fit. A coworker suggested I look into board games instead, and on an extremely sleep deprived trip back from a work thing in Boston, I basically translated the video game into a card game idea mid-flight. When I got home (after some sleep) my wife and I spent hours sketching up and throwing out idea after idea until we finally had some solid, simple mechanics. The next day I built the entire set of cards out of index cards, pen, and marker, and we play tested it that night. Since then we’ve iterated on the design, tested a lot, printed a few prettier prototypes, and added many different rules to fill it out while keeping it as simple and balanced as possible. 4. Was it difficult finding playtesters? How did you find them? It’s hard if you’re an introvert, and at my core I definitely am. I had to learn to reach out to groups in the community to find people to test that weren’t family or friends. That said, Meetup was essential to finding new people to test. And being willing to just take it, play it in public, and let people sit in has also been an important way to get new people interested. You’d also be surprised how willing game stores are to help you set up play test events for your game. I’m working on setting some up in the Austin area soon. 5. Have you published “Guild Leader”? I haven’t published yet, but I am pitching it to publishers while working on self publishing at the same time. If a publisher picks it up before I get there, all the better, and the more I’ve got done the easier it is to pitch it. 6. What company did you have print your prototype? – I went through The Game Crafter to do this. They are fantastic for quality prototypes, but even they suggest to go outside of them if you do a major production run. That said, they also offer advice on this process, so it’s really a great site if you’re ready to have a nice prototype printed. 7. How many hours do you think you spent promoting your game? Oh man, a lot? Not enough? All told I’ve probably put a few hundred hours into walking around game conferences with it, talking to vendors about it, pitching it to publishers, and managing the Facebook page. I’m still learning how to handle the social media aspect and I’m in dire need of getting a website and dev blog up for it, so those are my next steps. 8. Where did you promote your game? Facebook primarily, as well as in person to publishers and producers at PAX South, SXSW Gaming, and game stores. 1. What are several things you wish you did differently when creating your first game? – I wish I moved faster and that I had made the rules looser to begin with. I started with a very strict “phases approach” to turns, similar to Magic the Gathering, and it’s really made the balance a bit of an issue. We’re testing a much looser mechanic where you have actions per turn instead of phases and I think it will work better. I was trying too hard to imitate a game system I was already familiar with thinking it would make things easier. 2. Why did you set out to create your first game? – Passion. I love games and primarily love creating new games and watching people enjoy them. I made this to be a game I could play with friends or my kids. And with any luck, to make a living off of doing what I love to do. 3. What is your favorite aspect of game design? Choice. I love working through meaningful choices and watching people look at something with simple mechanics then suddenly light up with the realization of the impact any given choice will have on the overall game. If I’m getting that effect, I’m going the right direction. 4. 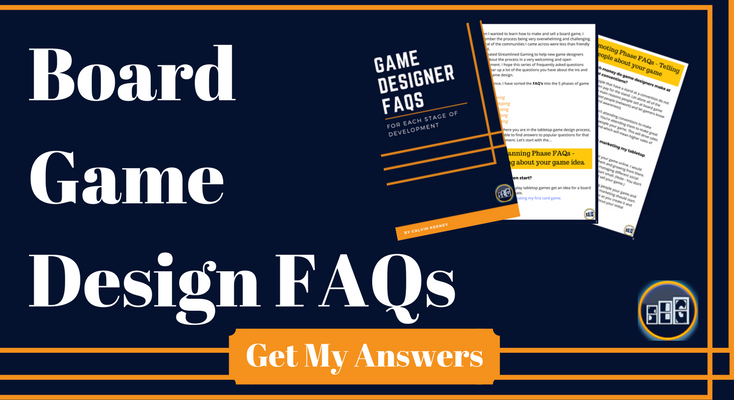 What is your least favorite part of game design? Minutia. I hate having any sort of complex rules and strive to make the game system as intuitive and simple as possible while leaving an underlying strategy in place for people to discover as they play something seemingly simple. I don’t enjoy having specific rules for specific situations, or rules that require you to constantly reference a book to know how things play out. 5. How long did it take you to create your first game? – I’m still working on it, but so far I’ve put about a year into this. 6. Additional Comments – One of the biggest stressors I’ve found in this process is managing new ideas. Since starting serious work on “Guild Leader” and making great progress, I’ve had at least 5 more solid ideas come up that I desperately want to work on. Making myself focus has been hard, though I did manage to prototype “Ten-Thousand Goblins” as it was actually the board game manifestation of my best video game prototype I’d tried a few years back and was put together in an afternoon. There’s also the work in trying to start a small business that has been incredibly difficult to work through, but I’m sure it will pay off in the long run to do it right instead of rush in without all the knowledge needed. Thanks for the interview Mike. I thought it was cool that you transitioned your video game ideas into card (board) game ideas. I am similar in that I used to think out video games to create, but then realized it would be easier to make a card game. Great work!